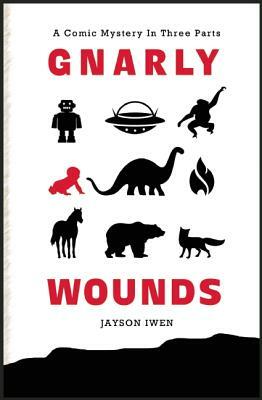 "Gnarly Wounds" tells the tale of one man's horrifyingly funny journey through grief, madness, and amnesia. In three linked novellas, Jayson Iwen takes readers into a smart and raunchy dreamscape full of riddles, jokes, and metaphysics, with a cast that includes the ridiculous son of an eastern European dictator, monks, witches, soldiers, furry animals, an ex-hitman, a super strong baby, and more. Told in several different cultural registers elegant and blunt, tragic and comic, contemplative and action-packed this is a one-of-a-kind mystery, hilarious and profound. Jayson Iwen is the author of two books, "A Momentary Jokebook" and "Six Trips in Two Directions." He's studied and worked in software, security, insurance, construction, ecology, and education in a number of different countries, including the U.S., Cuba, Guatemala, Peru, Egypt, Syria, and Lebanon. He lives in Wisconsin.